Photo: Barnard Cobblestone House, ca. 19th century, 7192 West Main Street, Lima, NY. Listed on the National Register of Historic Places in 1989. Photographed by User:Lvklock (own work), 2013, [cc-by-3.0 (creativecommons.org/licenses/by/3.0)], via Wikimedia Commons, accessed November, 2013. The Livingston County Government Center is located at 6 Court Street, Geneseo NY 14454; phone: 585-243-7000. Livingston County was erected from Ontario and Genesee counties on February 23, 1821, and is named in honor of Chancellor Robert R. Livingston who helped write the Declaration of Independence. After the Revolutionary War, people from New England, Maryland and Pennsylvania came to settle the Genesee River Valley bringing their knowledge of agriculture and methods of raising cattle and sheep. They built flour and grist mills on the numerous small streams and on the Genesee River. 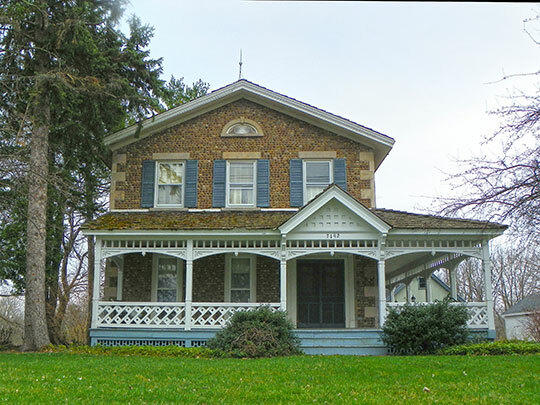 The most prominent of the settlers were the Wadsworth's from Connecticut who came in 1790 to the Seneca Indian village of Big Tree, now Geneseo, the County Seat. Growth of population came with the completion of the Genesee Valley Canal (1840-1872), with the expansion of railroads, and with health spas, which reached their height of popularity in the 1850's. Livingston County Directory, 2009, Geneseo, New York, www.co.livingston.state.ny.us, accessed June 2009.